Baked brie is a great and easy appetizer to bring to any holiday party. I showed my roommate Ariana how to prepare it for our potluck Thanksgiving dinner, and since then I have received a lot of requests among my friends for the recipe (Ariana did a great job making it!). Instead of sending each of them an individual message, I have decided to just post it on my blog for all to view and enjoy!! Unfortunately, now I think everyone is going to offer to bring baked brie to my next potluck…but brie is delicious so I would be okay with that. You can make this dish using either philo-dough or puff pastry. Philo-dough is flakier and a little bit more difficult to assemble because it is done in thin sheets one at a time. Therefore, I encourage using puff pastry dough if it is your first time making this dish! Also, feel free to substitute different nuts and flavors of fruit preserves, such as walnuts and/or Black Current preserves. Get creative! Defrost puff pastry for about 15-20 minutes and then unfold. 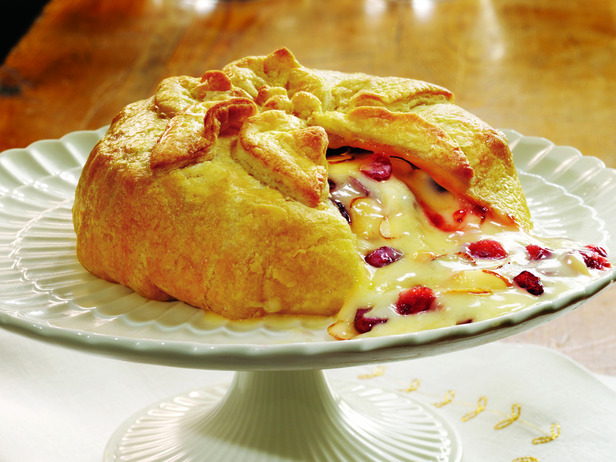 Place the wheel of brie in the middle of the pastry dough and top brie generously with fruit preserves and then nuts. Fold the puff pastry dough up over the toppings and wheel of the brie, gathering up the edges in center and gently squeezing together the excess dough at the top. Brush the sides and top of the puff pastry dough with the beaten egg using a silicon brush. Place the brie on a cookie sheet lined with foil and bake for about 20 minutes, or until pastry dough is golden brown. Allow to sit for 2-3 minutes and then serve with crackers and fresh fruit. Defrost philo-dough for about 15-20 minutes and then unfold. Place the wheel of brie in the middle of the dough and top brie generously with fruit preserves and then nuts. Melt the butter in a small saucepan over medium heat. Fold the philo-dough up over the toppings and wheel of the brie one thin layer at a time. In between layers, brush butter onto dough (almost as an adhesive) using a silicon brush. Continue in layers until the brie is well covered, gathering up the edges in center and gently squeezing together the excess dough at the top. Brush the sides and top of the dough with butter one last time and then place the brie on a cookie sheet lined with foil and bake for about 20 minutes, or until pastry dough is golden brown. I’m gone to inform my little brother, that he should also go to see this web site on regular basis to get updated from most up-to-date information. oooh! i’m going to to bring this dish to our office Christmas party tonight. it looks so delicious it is sure to be a hit! merry, merry! One of my favorite holiday recipes! Enjoy! Thanks for the recipe! I can’t wait to make my own baked brie. It was so delicious when Ariana made it (all thanks to your recipe of course).